So when George tells people that he was disappointed to have run this year’s Boston Marathon in three hours and six minutes it’s hard for many of them to understand. 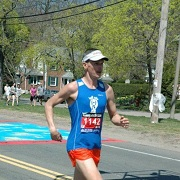 His recent blog post about the third hottest Boston Marathon in its 114 year history is a hilarious and poignant story that explains the regret he was trying to manage in the weeks after the race. Once you read it, I think you’ll have a a better understanding about his disappointment, but you’ll still probably have some thoughts like this, “Come on! 3:06 is an amazing race time. It’s nothing I could ever do and it’s definitely impressive given the conditions. Don’t worry about it, George. You did great.” The words in your head may be different, but I imagine you get the gist. And it’s one of the things most of us do when we’re listening to someone else’s pain and disappointment. We want to reassure and comfort. We want to point out the bright side and believe that everything will be okay. These desires come from our best intentions, but unfortunately, they often have the unintended consequence of dismissing the person’s feelings about the situation. When someone tells you she’s lost her job, the difference between “I’m sure it will all work out” and “I really hope it all works out” is significant. I appreciate that Stephen Covey encouraged us to “Seek first to understand,” but I think it’s important to acknowledge that really understanding someone else can be difficult and sometimes impossible. However, I still think we can be good listeners and witnesses to one another’s pain if we release ourselves from the pressure to understand. We need to avoid the tendency to be overly reassuring, tell our own story too quickly, and generally start filling the silence with too many questions or observations. I’m not saying you have to sit silently and be unresponsive, but I’d encourage you to allow for that silence. Ask one or two open-ended questions, resist the temptation to solve the problem for the person, wait to talk about your own story until later in the conversation and generally focus on being present to the story you are being told. When you find yourself confused, disagreeing with the talker, or quick to reassure, try to just be curious and use your imagination through internal questions like, “What if I had broken three hours for a marathon last year? What if my goal was to run 2:46 at the Boston Marathon and I didn’t do it?” When I ask workshop participants to close their eyes and visualize the people who really help them feel heard, most report back that it’s a very short list. I’d like you to become one of those listeners for some of the people in your life. Let me know how it goes.